This is the first biography ever published about Detlef Lienau, the Beaux-Arts-trained architect who in the mid-1800s introduced the French style of design to wealthy patrons of American Victorian architecture. 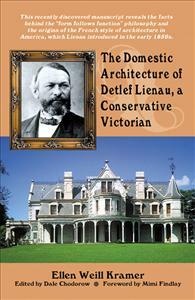 Detlef Lienau (1818-1887) is one of the overlooked but influential architects of the latter half of the 19th century, who introduced the French style to American building construction, notably the mansard roof and its decorative flourishes. Trained at L’Ecole des Beaux-Arts, he designed virtually every kind of Victorian structure—cottages, mansions, townhouses, apartment and tenement houses, banks, stores, offices, factories, warehouses, schools, libraries, and even a museum. Lienau was recognized by clients and colleagues alike as one of the most able creative and technical architects of his period, and was one of the founders of the American Institute of Architects.